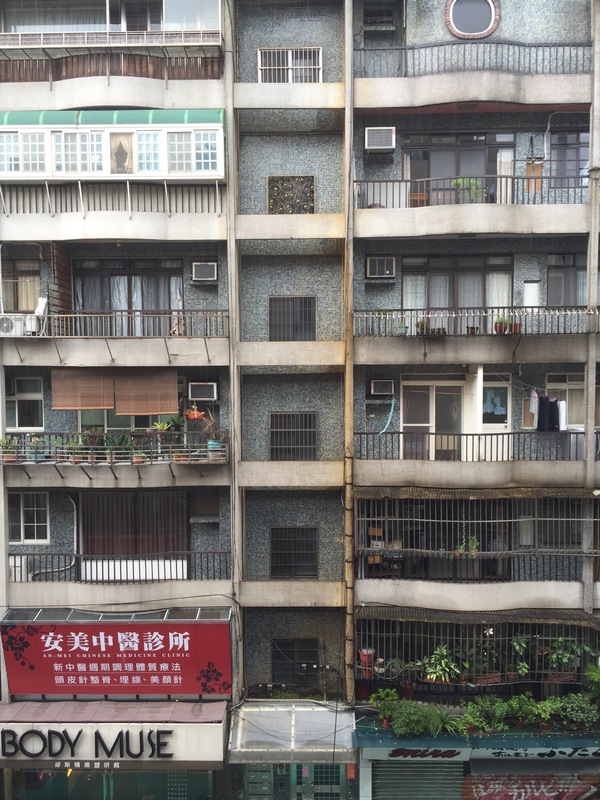 Before I even started searching for an Airbnb for this leg of the trip, I tried to imagine what a “typical apartment” in Taiwan would look like; would they be small, like Japanese apartments? Would older buildings have tatami floors, or something similar? Would the facilities be on par with what I’m used to in Japan, or would they be lacking in some way? When I tried to imagine how Taiwanese people live, I was drawing a blank–admittedly I knew nothing about the average lifestyle here. When I found this apartment on Airbnb, I fell in love with the cool colours, the simplicity, and the extra space, but at the cheap price of only 9900yen ($99) a day, for three nights and four days, I wondered if it was too good to be true. After some research, it turns out that “illegal” rooftop flats are a thing in Taiwan, “illegal”, as in, they are extra properties added on by the owners of the building after the building is made. The government estimates there are currently over 600,000 “illegal” properties in Taiwan, they are usually rented out for a cheaper cost than regular apartments, as pocket change for the building owners. I suppose that explains why, when entering the building, the elevator only went to the seventh floor, and we had an extra flight of stairs to go before we reached our room on the eighth. Thankfully though, this flat seems to have been built with love and care. Everything felt clean and “new”. It even came equipped with TWO air conditioners, which kept the interior cool and dry (while outside was hot (32℃/89°F) and humid). Every time we came back to the apartment and opened the door, we were greeted with a blast of refreshing cool and dry air. As for space, this flat is more than twice the size of my apartment in Japan. I was particularly excited about having a private bedroom with a REAL BED! In Japan, I still sleep on a futon on the floor in a loft. This was a welcome luxury to me, on the left side of the bedroom, was a long horizontal window with curtains, exposing a view of the patio, complete with a city skyline and the famous, former tallest building in the world Taipei 101 in the visible distance. 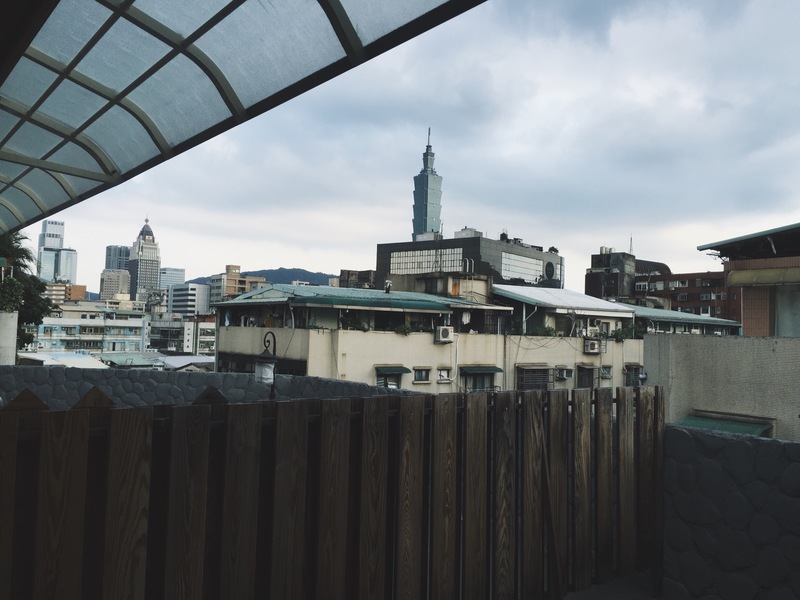 “Illegal” or not, being on the top floor of an apartment complex in the middle of Taipei felt pretty darn amazing. Even on cloudy days, the amount of natural lighting the windows and balcony brought into the apartment was a really nice touch, and in the mornings, sipping 7-11 black tea on a rooftop patio in the centre of a residential neighborhood, listening to the sound of motorcycles sputtering by while contemplating how to spend the day, is one experience a hotel simply cannot replicate. Unlike our Airbnb in South Korea, this apartment didn’t come with any amenities or extras to make our stay easier. It clearly stated on the Airbnb listing that it wouldn’t include anything, but I still wish there could have been some English pamphlets or at least a map of the area to help us get around at first. Not a big issue though, as we are adults who can take care of ourselves, and we did have WiFi access in the room, so we were able to screen-shot a few maps to rely on while we were out. The Dunhua area in Da’an, where we stayed, was actually very convenient. Lots of old clothing stores, scattered amongst world famous brands, like Converse, Hurley, and Adidas, and a seemingly endless choice of restaurants and places to grab a snack. 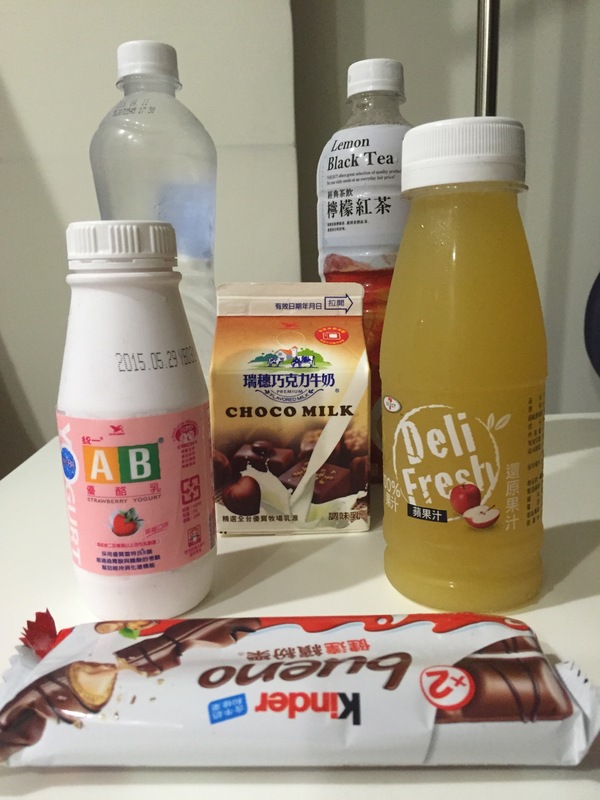 There was a 7-11 right across the street from our apartment, so we stocked up the fridge with drinks and snacks immediately. The day we decided to adventure out to Taipei 101, we relied solely on our human instincts and senses of direction, from ground-level we only caught glimpses of the building peeking through alleyways or sticking out over buildings, but made our way in it’s general direction regardless. 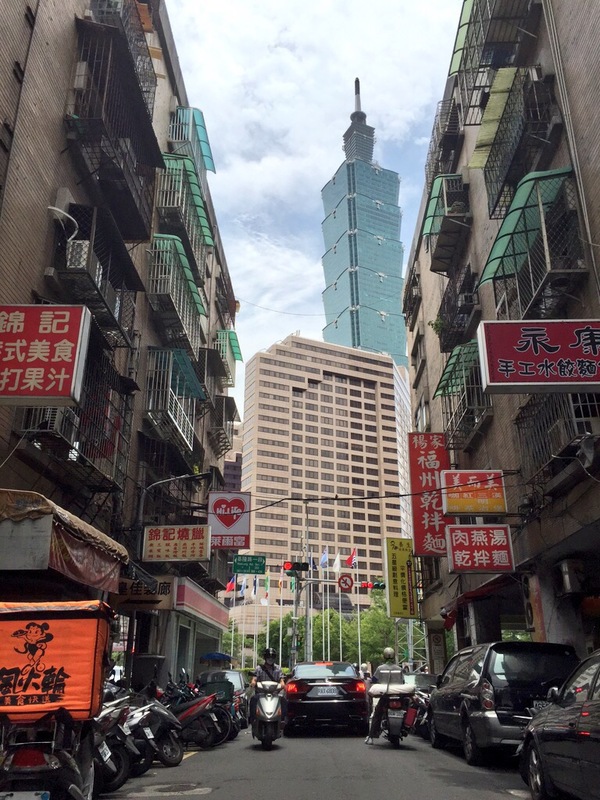 This actually turned out to be a lot of fun, because we wandered through streets and neighborhoods and got a first-hand feel for the Taiwanese lifestyle along the way. 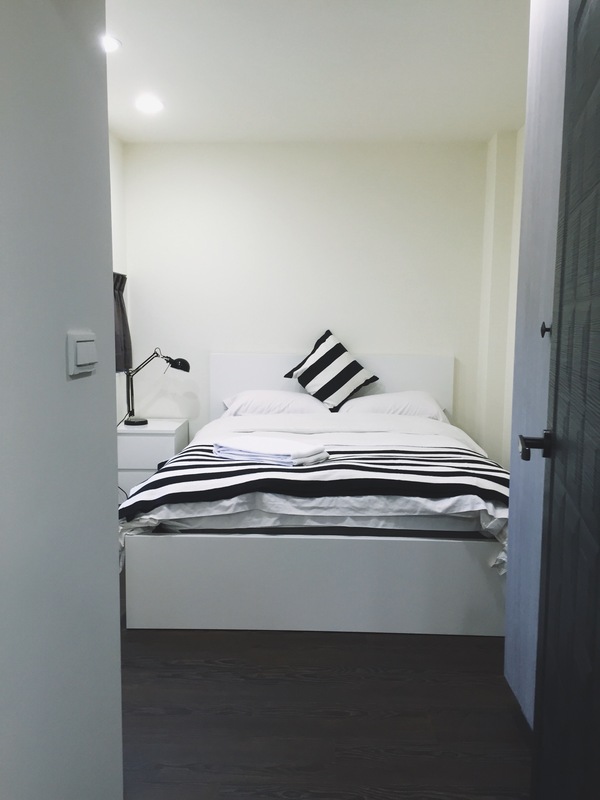 For those of you who might consider visiting Taipei yourselves, I’ll include a link to the Airbnb that we stayed at, but I also encourage you to check out other Airbnb listings in Taipei, because there are lots of really interesting designer rooms for fairly decent prices throughout the city. If you’re not sure where to go, however, the area that we stayed in, known as Zhongxiao Dunhua, in the Da’an area was very nice with plenty to do and see (and eat). Hope this helps! 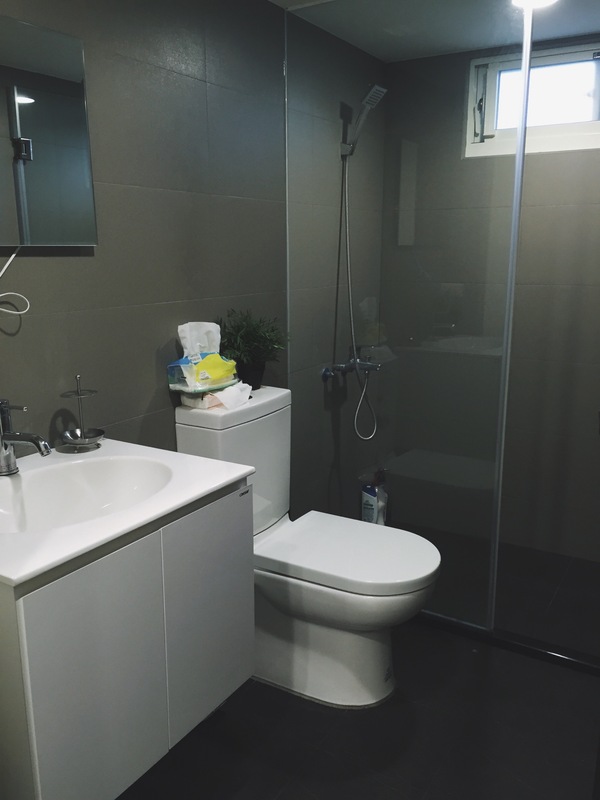 Posted in Airbnb, Asia, アジア, エアービーアンドビー, 観光, Taipei, Taiwan, Tourism, Travel, 台北, 台湾, 旅Tagged airbnb, Apartments, Asia, アジア, アパート, エアビーアンドビー, トラベル, ホテル, ミカエラ, ciaela, 物件, 観光, Hotel, Micaela, Micaela Braithwaite, Taipei, Taiwan, travel, 台北, 台湾, 宿泊, 旅, 旅行Bookmark the permalink. You seem that you had a good time in Taipei. Actually, there is no such a room like the airbnb in Japan, but I recommend you Minshuku, in stead. There, you can enjoy local foods and very warm hospitality, in general. Because you speak good Japanese, I guarantee that you can enjoy communication with people at Minshuku. It would really help if you provide the Kanji or the Traditional Chinese for the names you mentioned. Yes, you can rely on the English translated version (romanji), but… sometimes the locals can’t tell. For examples, Zhongxiao Dunhua 忠孝 敦化, in the Da’an 大安 district. Your English article didn’t mention much about the MRT. Actually, you might want to explain Metro Rapid Transit a little before you use the abbreviation. People have mentioned that the neighborhood map (multi-lingual) in each MRT station, along with garbage cans and public restrooms, are very helpful for the tourists, to me at the least.